We are incredibly excited to announce that we made a new friend! YAAAAAY! The Geektitude podcast has joined the Geek to Geek podcast network. Geektitude is an interview show, which our network has been looking to include for quite a while. We just had to find the right one. And Joe is the right guy for the job. We couldn't be happier with the addition, and we certainly hope y'all will give him the same kind of love and warm-fuzzies that you have given the rest of us. 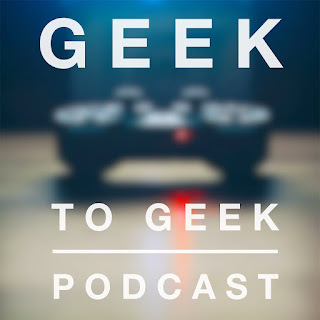 Make sure you head over to the Geektitude Facebook page and give it a like, subscribe on iTunes or your favorite podcast app, and give him a shout at @epicgrays on Twitter. And you know what's best of all? He has like 70ish episodes to listen to already, so what are you waiting for? Get to streaming! Void beat Mass Effect Andromeda very quickly. He reviews the game for those of us who haven’t played it, and he discusses the game’s strengths and weaknesses. Primarily, the open-worldedness wasn’t interesting enough to make him explore, the new races were too limited, and the story was pretty similar to the old one. The thing is, Void wanted to love this game, and instead he only liked it. There is a lot to like here, and a lot of the internet’s reactions have been overblown. The new dialogue options are really great, and they work a lot better than the stark good/bad dichotomy most Bioware games have. The premise of the game is still pretty amazing, and he has incredibly high hopes for Mass Effect Andromeda 2 because this first game laid a great foundation for a series, provided they make a series of improvements he outlines in the episode. More and more these days, games aren’t a buy-once/play-forever kind of thing like they used to be. Between DLC and expansion packs and passes and constant content updates, video games have to be treated as a service to keep players interested. We discuss a number of these models--MMO subscriptions, the one-game-I-play-forever-and-nothing-else system, microtransactions, mobile updates, events, episodic releases (free and paid), and even things like toys to life and shareware titles from a consumer standpoint. Get DUNE by Frank Herbert at audibletrial.com/geektogeekcast and see why Mass Effect Andromeda has all the genre conventions it does. Getting into Star Wars can be tough. It has a huge history and a gigantic fanbase, and with 50 years behind it, some people are intimidated by the franchise and don’t know how to jump in. Never fear, geeks! We’re here to help. Inspired by our resident Jedi Noobs Chocobochica and CapsuleJay (among others! ), we want to make sure that Star Wars is not unapproachable. We provide suggestions on the best viewing order on the movies, as well as jumping-on points that aren’t necessarily even tied in with the films. There is a huge swath of Star Wars-related media out there, so if you’re a book person, we recommend books (specifically, audiobooks! ), or if you’re a gamer, there are always video games, and if you like to binge, you can even jump in with some of the cartoons and even different ways to watch those! We discuss the oft-mentioned Machete order, as well as how The Force Awakens (Episode 7) changed the way you jump in and get accustomed to the galaxy far, far away. Even spinoffs like the recent Rogue One and the upcoming Han Solo films present unique ways to dip your toes in without needing 50 years worth of history to make sense of it all. Head over to audibletrial.com/geektogeekcast and grab either LOST STARS or A NEW DAWN. They are phenomenal audiobooks, and because they’re Star Wars, they have ultra-high production qualities. Zelda Zelda Zelda. Breath of the Wild has made him pretty much live in Hyrule. Read Wayward and Ratqueens, which has been given a soft reset, which means you can get into it easier now. The Legend of Zelda: Breath of the Wild is finally out, and Beej and Void are playing (and loving) it. Void has it on the Switch, and Beej grabbed it on Wii U. We discuss the differences in the versions and how each piece of hardware handles the game (hint: they’re pretty much the same). We discuss how Breath of the Wild treats armor and weapons differently than other games in the series, making it much more like a traditional RPG, but still feeling totally like Zelda. The setting is a unique version of Hyrule, and it’s a welcome change. You can see the other Hyrules there, but this one feels more alive...even though it has technically been destroyed. Nintendo did what Nintendo does: makes a game full of fun little details. In a way, they did what Blizzard did with World of Warcraft--took an existing genre and perfected it. The game assumes you’re not stupid and doesn’t have a real “tutorial.” You have an intro, get some abilities, and are set into the world. It’s awesome. Hardest Zelda ever. And that’s a good thing. There’s a story we care about, and we didn’t expect that from a Zelda game. But it’s not a Final Fantasy-style story. It’s told in a really cool way. There are multiple game systems that Void really loves digging into so that he can experience new and interesting gameplay that may not have been designed or intended, and even Beej got into figuring out how to use the game’s physics and systems to think outside of what the standard solution to a puzzle or fight would be. Overall, we are in love with this game, and we think it is worth every penny and second you spend with it. Play Zelda: Breath of the Wild for FREE by going to gameflyoffer.com/geek and help us out and support the podcast while you’re at it. Persona 4 Golden is still cool, but he got Zelda, so that’s taken priority. Shovel Knight is just as awesome on the Switch as it ever was. Nintendo Switch is here! It’s launched! Void got one! Beej didn’t! He can’t find one at all! There were however...hiccups. Don’t buy day-1 console hardware from Amazon. Why is Nintendo marketing it as a console that you can take with you instead of a handheld that docks? It plays better when it’s not docked. Suspend any time and anywhere, like a handheld. Faster suspend and more integrated than PS4. Definitely leans toward the handheld side and not the console side. Docking and undocking is very close to seamless. Just be slightly careful lining up the system when docking. It’s smart when it’s charging in the dock and you pull it out it prompts you to triple tap a button to unlock the screen. Posting to social media is easier than other systems. Plus you can add text and edit images! I like the “HD Rumble” more than rumble on most controllers. No install time for games! Even update patches are downloaded and applied in the background while playing. Bomberman is Bomberman. Camera can be annoying. Kids love it. Snipperclips is a secret must-own game if you can have 2-player local co-op. Fast RMX is cool if you like reacing games like F-Zero or Wipeout. Zelda is amazing. I’m fairly sure this will be my favorite Zelda game ever. Next week will be all about Zelda, so not much detail here, but TONS next week. Void’s kids like it a lot, and the joycons are perfect for them because not only are they small, they’re much simpler in terms of buttons and control schemes. Daughter didn’t feel great the other night, and it was great to be able to move around and be near her. Beej: ERMAGERD LOGAN ERMAGERD - Read Old Man Logan, the original story that was in Wolverine (2003) #66-72, hit on a lot of the film scholar background Jennifer and I have, and we may end up doing a podcast together about it soon / Jennifer beat Journey again, and it was super relaxing to watch / Picked up Persona 4 Golden for Vita while it was on sale. Digging the music so far, thought it was hand-drawn for some reason / Finished Saga, and I desperately want more. Void: Played the Switch. Obvs. / installed level 2 charger install for the electric car! It’s awesome! Day 1 technology and console adopters vs… not. The Nintendo Switch will be out by the time many if you listen to this, and we wanted to talk about tech that we grab on Day 1. And tech that we wait for. Which consoles or tech have you picked up on day one? For us, it depends. Void grabbed Gamecube, Gamecube, GBA, PS2, Vive, and the Xbox 360, while Beej was mostly a Month 1 person as supplies and money allowed. Dreamcast was his favorite Day 1 purchase. Most of our Day 1 video game consoels were when we were younger and had far more disposable income than we do as adults. We waited on a lot of consoles, too, whether it was for hardware upgrades or some other reason. Beej waited on the 2DS, the PS3, and the PS Vita, and they were all fantastic purchases. Void really loves that he waited on the 3DS XL, the PS4 (Black Friday bundles FTW), the PS VIta, and the Wii U. Same for him--they were all amazing purchases. We both pick what we get on Day 1 kind of by gut feeling. We weigh the hype and whether we use it right away and how much we think it will impact our lives. Do we think that it will be a positive and consistent part of our lives? We don’t buy based on hype and what is getting the most attention, but at some point you just have to pull the trigger if you’re excited enough about it, personally. So...the Nintendo Switch. We recorded just a few days before the launch, and we are crazy excited, but we hope the JoyCon woes are taken care of. Void is getting one delivered to his doorstep so he can play as soon as he gets home from work, and Beej has to wait on grabbing one because he’s freelancing and money is spotty for the moment. If a new full-time gig comes in, he will run out and breathe in the Breath of the Wild. Nintendo releases on Fridays, which is great for adults who work. Weekend gaming binges! How many of you folks are buying a Switch on Day 1? Let us know in the subreddit or on Twitter! Please go to audibletrial.com/geektogeekcast and use your FREE audiobook credit on one of Beej’s audiobooks. Help him buy a Switch! The books are Birthright, Lineage, or Legacy by B.J. Keeton.